Good luck for openSUSE popularity @ Russia. I’ve checked Google Trend (http://google.com/trends?q=opensuse) and found that Russia is one of top country where openSUSE are a popular distro (based on search popularity). According to download counting on d.o.o, Indonesia will not be counting on the statistics because almost all of us download the iso or updating the package by using local mirror in Indonesia, although d.o.o has a redirect feature to the nearest mirror. 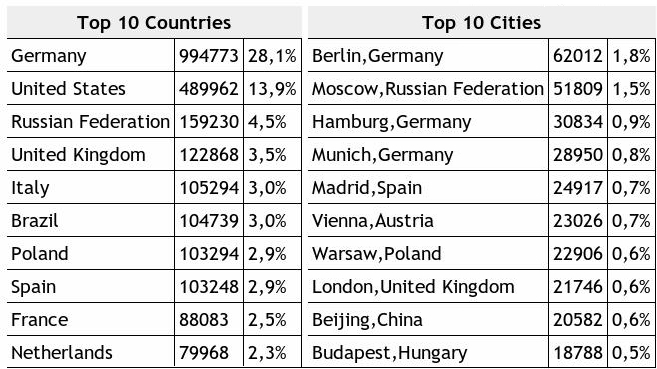 Well, I am from India but have been living in Moscow for ages, and openSUSE is my Primary OS for past 6-7 years now and I always ask friends to give it a try (or the Ubuntu) … so there is 0.1% of another reason why RU is on top of there. Hope after fixing performance issues the community will grow faster. 20% back from Mandiva and Ubuntu on a simple client/server test is a catastrophe, really. Awesome, glad to be part of it.